And now for something…slightly different. It’s all been a bit monochrome with the pebble for a while so I thought I’d share a recently finished fragment. 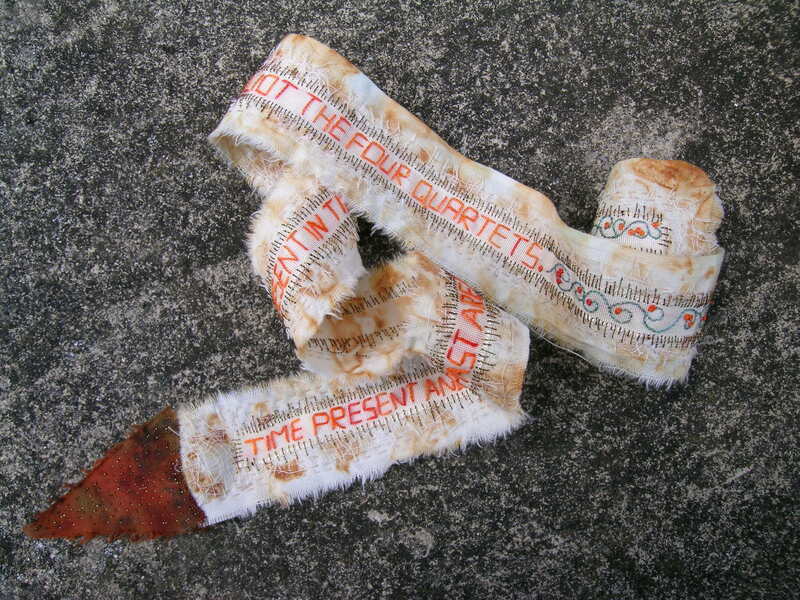 My fragments are fabric doodles, scraps of thread and cloth which I keep in my travelling sewing kit and put together to play about with when I’m out and about. This one is 3 and a half inches by just over 2 inches. 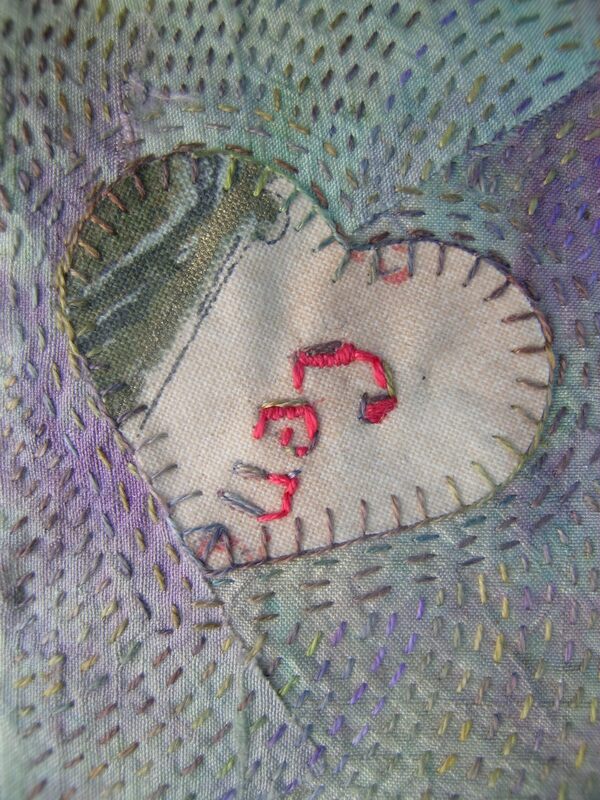 The background is offcuts of hand dyed silk left over from my ribbon rose thimblekeep arranged on a scrap of calico with a die-cut fabric heart in the centre. I love the almost indecipherable fragment of text on it. 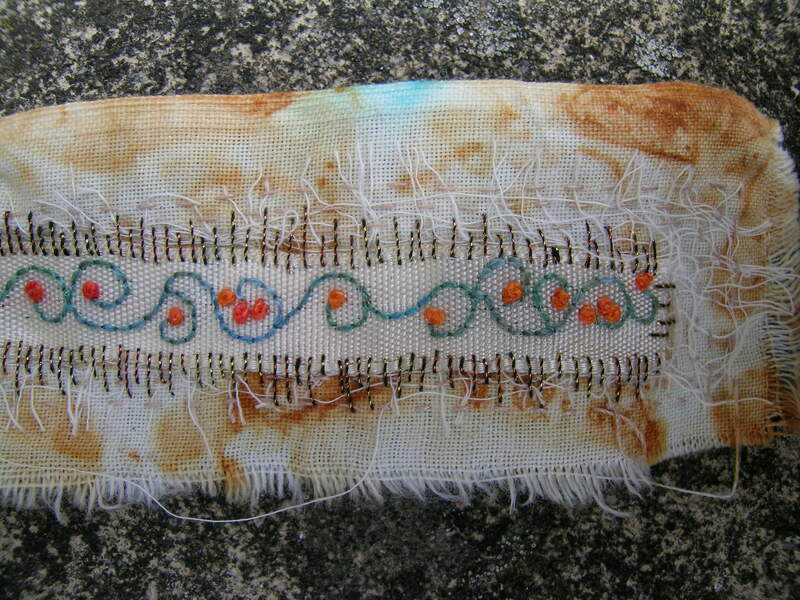 The whole thing is densely stitched in regular rows of running stitch like kantha work with Stef Francis stranded silks – again leftovers from the ribbon rose thimblekeep. 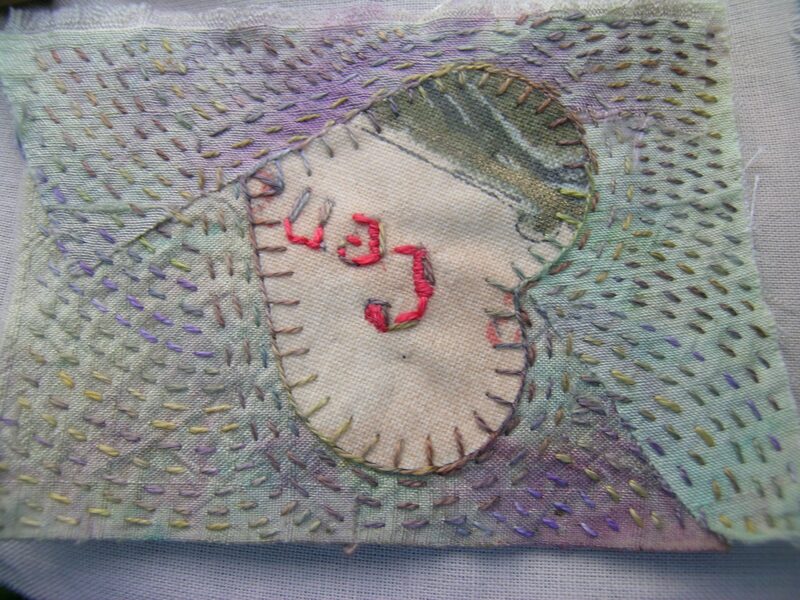 The heart was blanket stitched down and then several rows of running stitch worked to echo its outline. 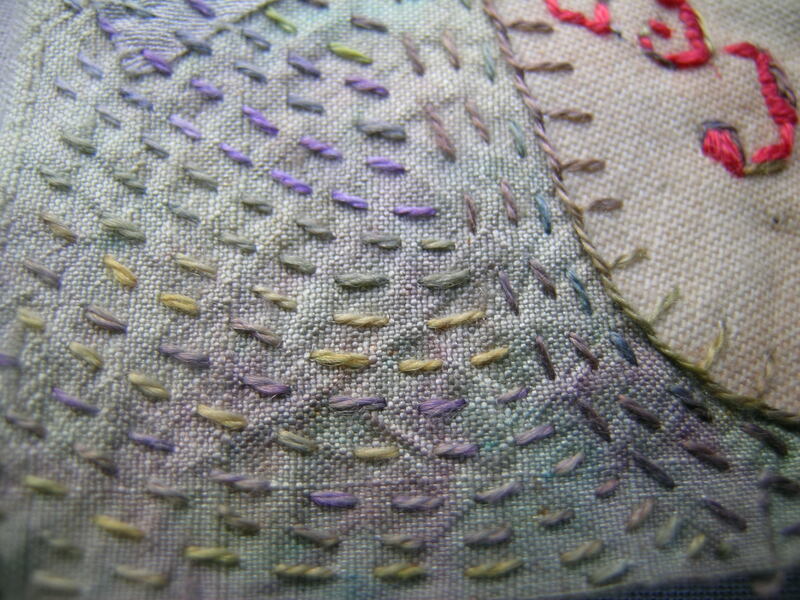 When I ran out of room going round, I changed direction and sent the running stitches in long gentle curves from the heart towards the edge of the fabric. 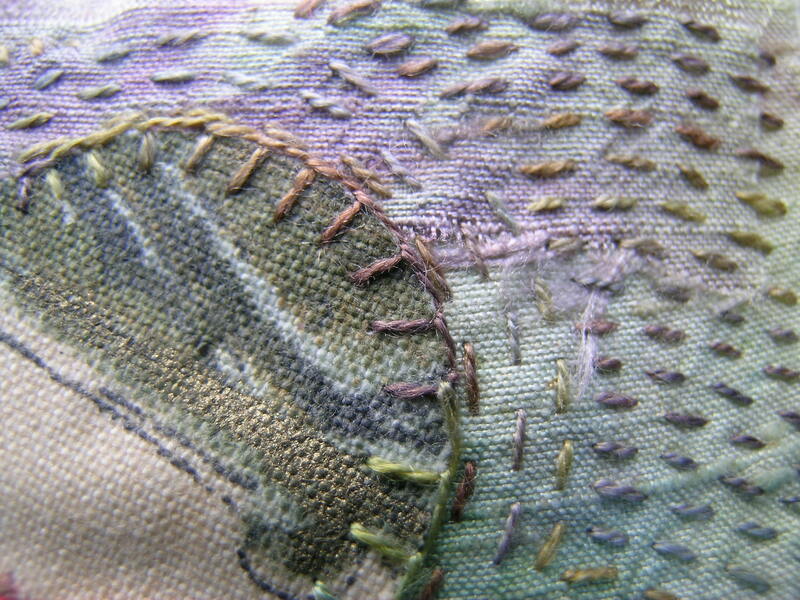 The stitching completely alters the feel of the fabric, partly hiding it; partly enhancing it. 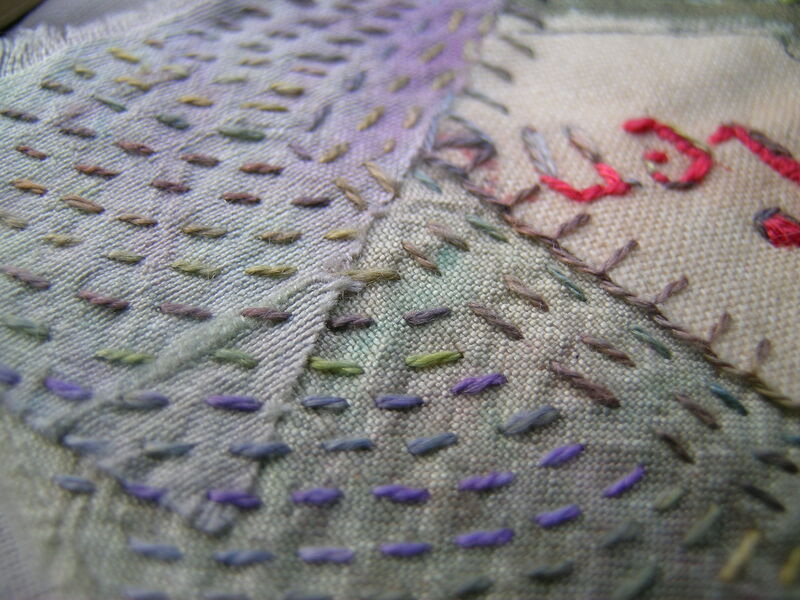 I love the way such simple stitching becomes alchemy, binding thread and fabric into something rich and strange. It’s been really busy with the show and then playing catch up to all the things that have to be put aside to give that level of commitment to a week long production but I hopefully should soon have some pictures of my new project. 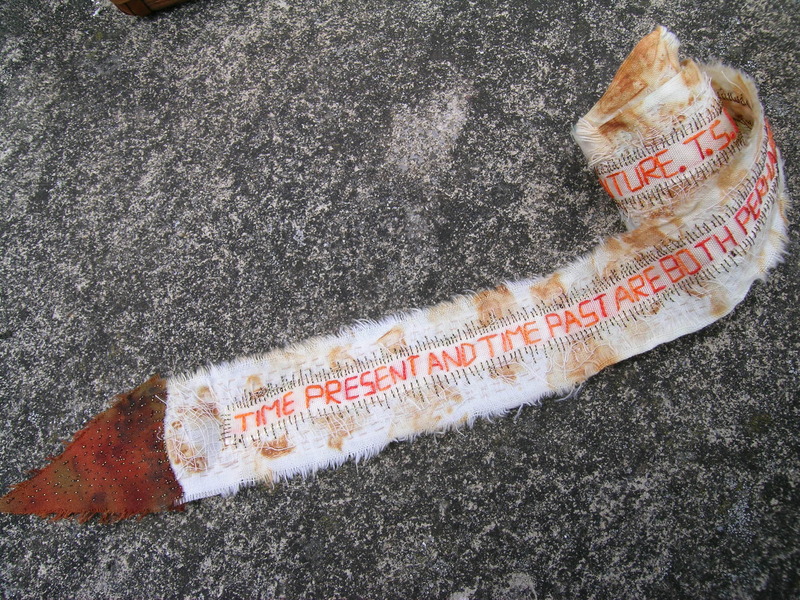 In the meantime, this is a small piece I made last year from a long scrap of rusted old cotton sheet, some medical gauze, a piece of vintage ribbon and off cut of hand dyed cotton. 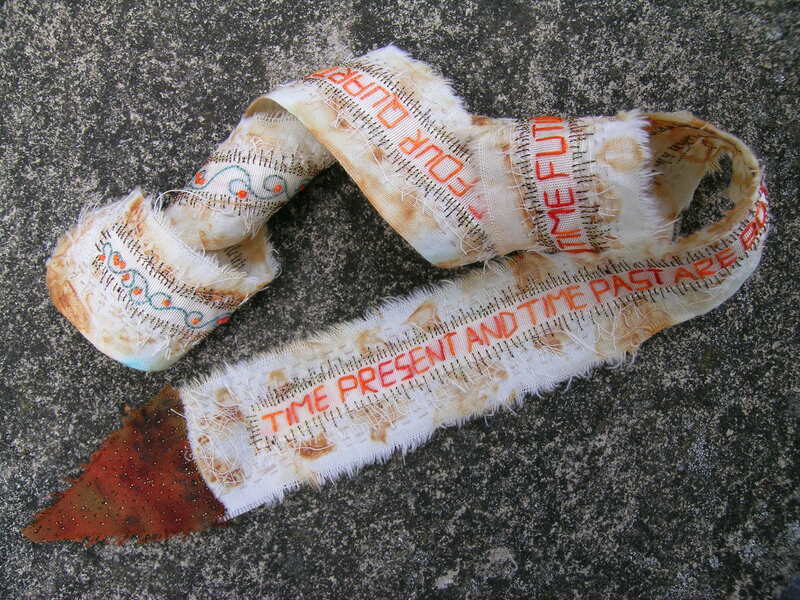 “Time present and time past are both perhaps present in time future.” T.S. Eliot: The Four Quartets. 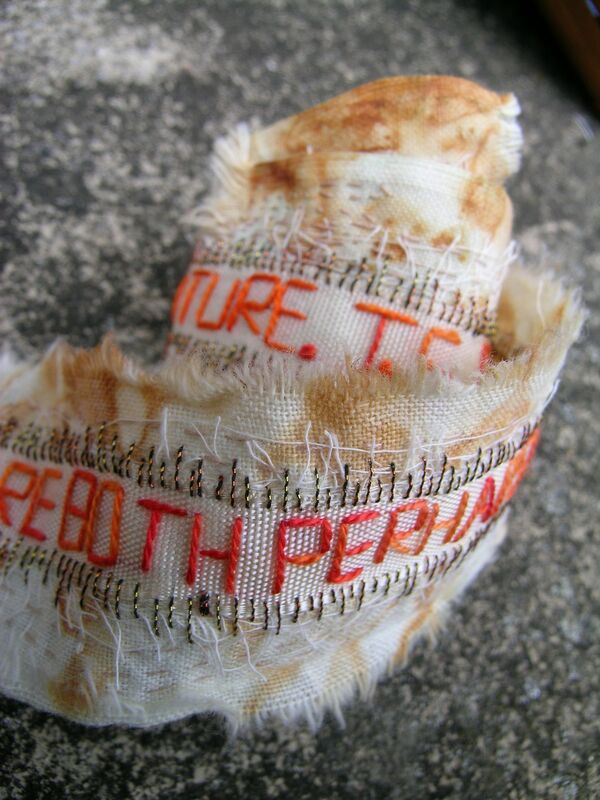 Ripped strips of cotton give a wonderfully soft frayed edge. 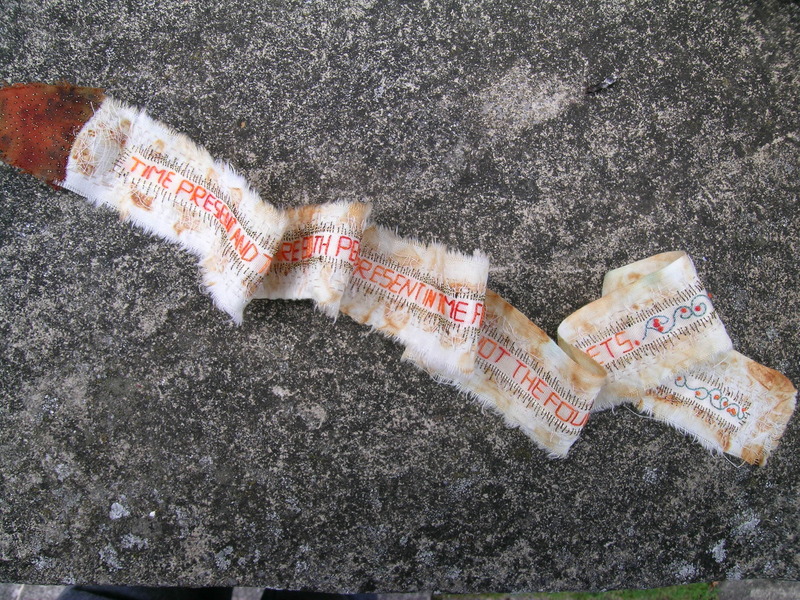 Strips of very open medical gauze are layered under the ribbon. 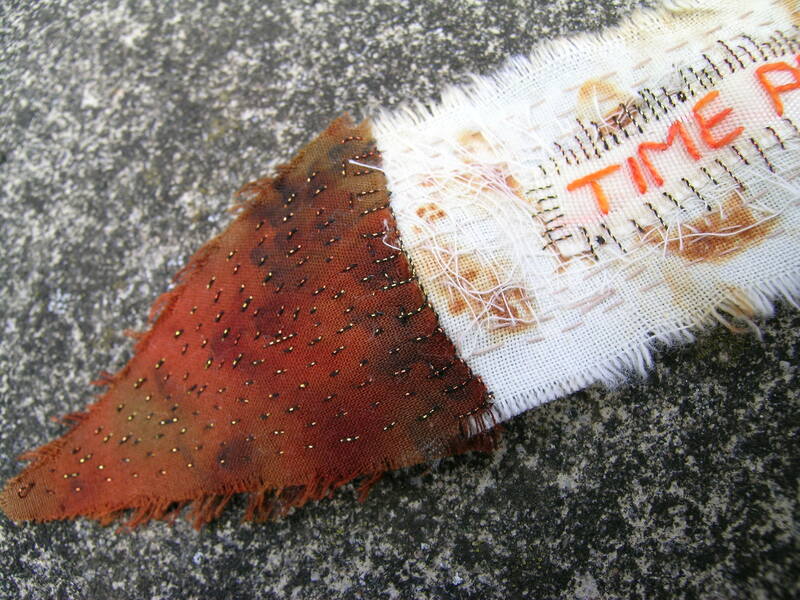 Rows of running stitch over the gauze keeps it anchored to the rusted cotton – in places. Straight stitches in fantastic variegated metallic Madeira thread hold down the ribbon. Since both sides are accessible it needs to look neat on the back too. Kantha stitched end ‘tag’. Also reversible. 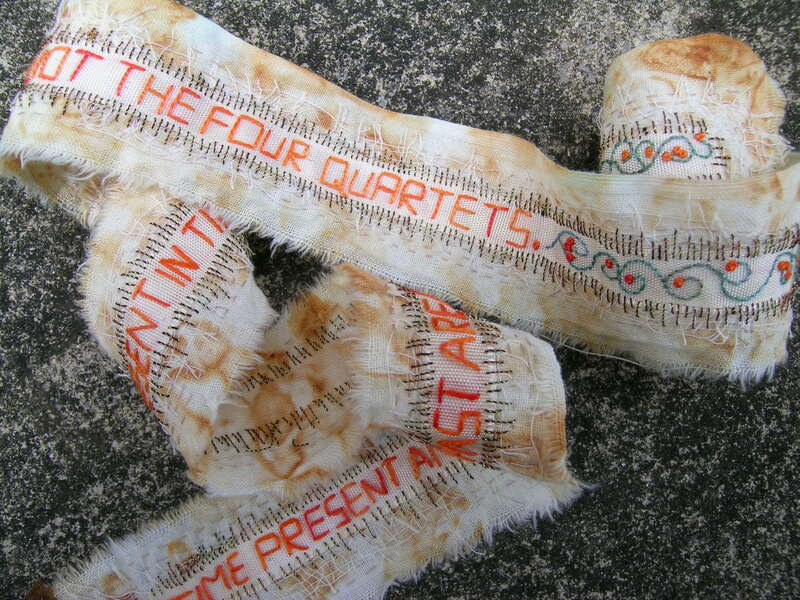 I love embroidering text and The Four Quartets is one of my favourite poems. It’s designed to be pulled out and read like a scroll. I’m still looking for the right thing to wind it onto – a chunky piece of driftwood perhaps or an antique wooden cotton reel or a turned wooden spindle.